I’ve referred often in these pages to the virtues of Canada’s late-19th century currency system, with its heavy reliance upon circulating notes issued by several dozen commercial banks, most of which commanded extensive nationwide branch networks. I’ve also lamented the fact that so few monetary economists today, let alone members of the general public, seem aware of that arrangement, the superiority of which, both absolutely and compared to its U.S. counterpart, was once widely celebrated. For I’m certain that, if more people were aware of it, the scales might drop from their eyes, plainly revealing the gigantic blunder our nation (and most others) committed by entrusting the management of paper currency to a government-sponsored monopoly managed by bureaucrats. So you might expect me to be jumping for joy after seeing this new Bank of Canada Staff Working Paper by Ben Fung, Scott Hendry, and Warren E. Weber, on “Canadian Bank Notes and Dominion Notes: Lessons for Digital Currencies.” But no such luck: instead, after reading it, I’ve been in a blue funk. How come? Because, instead of drawing badly-needed attention to the substantial merits of Canada’s private currency system, Messrs. Fung, Hendry, and Weber focus on its shortcomings, claiming that it suffered from serious flaws that only the government could fix. They then go on to argue that government intervention may also be needed to keep today’s private digital currencies from displaying similar flaws. In short, according to them, Canada’s experience, instead of casting doubt on the desirability of special government regulation of private currencies, supplies grist for regulators’ mill. Is their perspective compelling? I don’t think so. As I plan to show, and as even a cautious reading of Fung et al.’s own assessment will suggest to persons familiar with other nations’ experiences, the imperfections of Canada’s private banknote currency were minor ones, especially in comparison to those of the concurrent U.S. arrangement. Nor is it even clear that they were genuine flaws, in the sense that implies market failure. The reforms that eventually eliminated the imperfections were, in any case, not imposed on Canada’s commercial bankers against their wishes, but instigated by those bankers themselves. Finally, the suggested analogy between Canada’s 19th-century banknotes and modern digital currencies, far from supplying solid grounds for supposing that unregulated digital currencies are likely to exhibit the same (real or presumed) shortcomings as their 19th-century Canadian counterparts, is so forced as to be utterly unconvincing. For all these reasons, those seeking to draw useful lessons from Canada’s private currency experience will be well-advised to look for them elsewhere. Because there’s so much I feel compelled to say about Fung et al.’s paper, I’ve decided to devote several posts to it. In this one, I’ll assess that paper’s claims regarding the supposed shortcomings of Canada’s private banknote currency. In the follow-ups, I’ll address the claim that it took government regulations to perfect that currency, and their claim that Canada’s experience with private banknotes points to the likely need for government intervention to correct inherent shortcomings of today’s digital currencies. Finally, I’ll share my thoughts regarding the real lessons to be learned from Canada’s 19th-century currency system. Following Canada’s Confederation in 1867, that country’s paper currency consisted mainly of the circulating notes (or “bills,” as the Canadians called them) of a couple dozen commercial banks, plus some government-issued paper money known as “Dominion” notes. Although Dominion notes were made legal tender, both they and bank notes were payable on demand in specie. 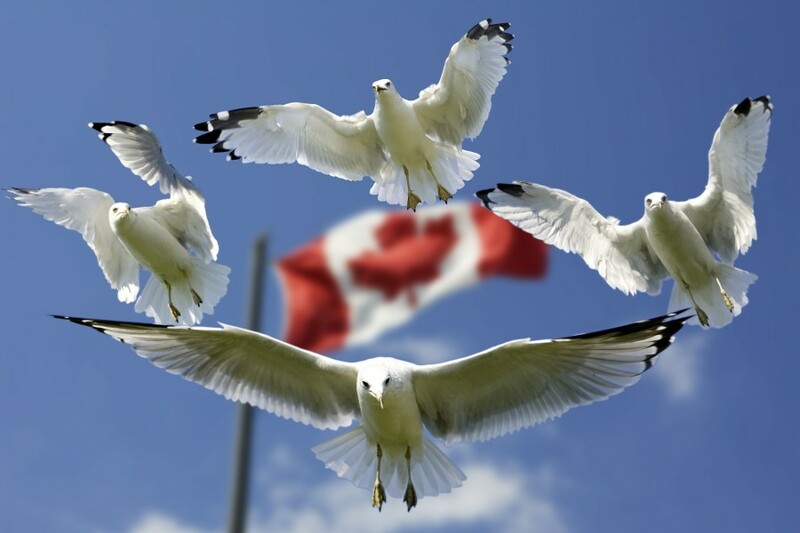 Unlike the notes of U.S. national banks, which had to be secured by certain U.S. government bonds, Canadian bank notes were backed by their issuers’ general assets. Canada’s banks were also free, unlike their U.S. counterparts, to establish note-issuing branches anywhere in that country, and even beyond it (several had New York City branches). Nor were the banks required to maintain any specific amount of cash reserves. After 1871, banknotes were limited to denominations of $4 or more; and in 1880 that minimum was raised to $5. The banks’ charters also limited their circulation to their paid-in capital; however that restriction didn’t become binding until the outbreak of the U.S. Panic of 1907. In short, the supply of Canadian banknote currency came very close to being completely unregulated. That lack of regulation, according to Fung et al., caused Canada’s private banknote currency to go awry in several ways. It was, they say, subject to “considerable” counterfeiting. And prior to the passage of the Bank Act of 1890 , it was also neither perfectly safe nor perfectly uniform. Bank failures sometimes exposed note holders to long delays in payment, if not to outright losses; and banknotes sometimes traded at a discount from their face values. How serious were these imperfections? Although Fung et al. speak of “considerable” counterfeiting, the adjective merely means that, at one time or another, attempts were made to counterfeit most of them, and that now and then substantial amounts of counterfeits were produced. It doesn’t follow that the counterfeits in question were capable of fooling experienced bank tellers (Fung et al. themselves recognize that many were of “poor quality”) much less that they were a serious menace to legitimate banks of issue (if they were, the record is silent about it). Still, counterfeits had their victims, and as such were a blemish on the Canadian system’s record. Regarding banknotes’ safety, Fung et al. note that, of 55 Canadian banks that operated at some time between 1867 and 1895, only three wound-up without paying their note holders in full. The Bank of Acadia, which failed in 1873, left most of its outstanding notes unpaid, whereas the Mechanics Bank of Montreal, which failed in 1879, and the Bank of Prince Edward Island, which failed in 1881, paid 57½ and 59½ cents on the dollar, respectively. Considering the size of the banks that failed, as measured by their total note circulation, these already very modest losses appear even less significant. At the time of its failure, the Mechanics Bank of Montreal had only $168,132 in notes outstanding. The circulation of the Bank of Prince Edward Island, at $264,000, wasn’t all that much greater. The Bank of Acadia, finally, was an outright fraud, for which no actual circulation figures exist. Assigning to its circulation the almost certainly too-generous value of $50,000, and allowing for a total circulation of all Canadian banks of about $25 million, the notes of the three failed banks made up less than 2 percent of the total. Not perfect, to be sure; but not bad at all. Stepping back to take in a still bigger view, the Canadian banks’ record looks even better: in all, between 1867 and the end of the century, the grand total of losses of all creditors of failed Canadian banks amounted to $2,000,000, which was less than 1 percent of the banks’ obligations. But to really appreciate how safe Canada’s banks were, one needs to compare their performance to that of banks elsewhere — something Fung et al. don’t bother to do. The contrast between Canadian bank’s safety and that of their contemporary U.S. counterparts — the notes of which were, remember, fully backed by U.S. government bonds — is especially striking. According to Andrew Frame, between 1863 and 1896, 330 national banks failed. Of $98,322,170 in accumulated claims against them, less than 64 percent had been paid by the end of the period, leaving $35,556,026 still due to creditors. Another 1,234 state banks also failed, leaving $I20,541,262 out of $220,629,988 in debts unpaid. In other words, the record of recoveries from U.S. bank failures taken as a whole was not much better than that of two of the Canadian system’s three worst deadbeats! There was, however, as Fung et al. also point out, more to the imperfect safety of Canadian banknotes than these recovery statistics suggest, for in some cases in which holders of failed banks’ notes were eventually paid in full, they had to wait for months, and in one instance more than two years, to be paid in full, or else had to settle for less by selling their notes at a discount. But here again, the extent of the losses involved mustn’t be exaggerated. Of eight banks that failed other than those that never paid their notes in full, five had fewer than $50,000 in outstanding notes, and the circulation of one — the Bank of Liverpool — was just $3,368! Furthermore, according to George Hague (1825-1915), a long-time Canadian banker and author of several highly-regarded works on the history and workings of the Canadian system, the notes of failed banks “have generally maintained their value, or fallen only to a slight discount until finally paid.” Payment also appears to have been made, in most cases, in a matter of a few months at most. Fung et al. point, on the other hand, to two notorious cases — those of the Consolidated Bank of Canada (circulation $423,819), which suspended in 1879, and of the Maritime Bank of the Dominion of Canada (circulation $314,288), which did so in 1887. Some holders of the Consolidated’s notes, they observe, submitted to discounts of 10-25 percent rather than wait for payment, while it took those who held notes of the Maritime Bank more than two years to be paid in full. Concerning these exceptions, in one case — that of the Maritime Bank — the bank’s liquidators were sued by the Receiver-General of the Province of New Brunswick, which was among its depositors. The Receiver-General claimed that, because it was a representative of the Imperial Government, the royal prerogative gave it priority over the banks’ other creditors, including note holders. (This was, it bears noting, notwithstanding the 1880 statute giving bank note holders a first lien.) The suit set in motion a protracted sequence of trials and appeals, culminating in a Supreme Court verdict in the provincial governments’ favor. It’s therefore not inaccurate to say that, if the Maritime bank’s note-holders, who were eventually paid in full, suffered in the meantime, the fault was neither the bank’s, nor its liquidator’s, but that of Canadian government authorities themselves, who were more interested in pressing their own claims than in satisfying those of Canada’s citizens at large. The case of the Consolidated Bank of Canada was, on the other hand, a genuine, if singular, blot on the Canadian system’s record, which led to the indictment, and nearly to the conviction, of several of the bank’s officers for making a “willfully false and deceptive statement” regarding the bank’s condition prior to its failure. (The gory details can be found here.) Eventually a broker paid $260,000 for the Consolidated’s assets, which it reported as being worth over $3 million at the time of its suspension! Finally, note discounts. It’s true that, before 1890, the notes of perfectly solvent Canadian banks sometimes commanded less than their full face values at places remote from their sources. Unlike information concerning discounts on antebellum U.S. bank notes, which can be had from numerous “banknote reporters” published at the time, details concerning Canadian banknote discounts are relatively few and far between — a fact that itself suggests that the problem was not so severe. What few details there are also suggest that note discounts were modest. According to L. Carroll Root, (p. 323), before 1890 notes from Nova Scotia and New Brunswick tended to pass at a “slight” discount in both Toronto and Montreal, while those of Toronto and Montreal tended to be discounted — again, slightly — in the Northwest only, while passing current in Toronto. There’s no denying that, whatever its merits, Canada’s private currency was less than perfect. But so what? Imperfection alone is no proof of market failure. To assume otherwise is to subscribe to what Harold Demsetz famously named “the Nirvana fallacy”: the view that “implicitly presents the relevant policy choice as between an ideal norm and an existing ‘imperfect’ institutional arrangement,” instead of recognizing that the relevant choice must be one between alternative realizable arrangements. More concretely and precisely, it’s necessary to ask, not whether Canada’s private banknote currency was “imperfect,” but whether it was inefficient. Alas, that is something Fung et al. never do. Was the Extent of Banknote Counterfeiting Inefficient? Yet the imperfections of Canada’s commercial banknote currency were certainly not such as might supply prima facie grounds for supposing that it was inefficient. Take counterfeiting. Yes, Canadian banknotes were counterfeited. But the same may be said for virtually every paper currency that has ever been issued, including every sort of official (that is, government or central-bank issued) paper currency. Experience shows, moreover, that even the most elaborate — and expensive — schemes for thwarting counterfeiters are incapable of deterring them. One need only consider the Fed’s frequent, futile efforts to render its currency counterfeit-proof. Nor has the Bank of Canada been much luckier. Indeed, if you’re looking for troublesome high-tech counterfeits, the best place to look for them is, not among Canada’s private banknotes, but among those paper currencies, including Canada’s 19th-century Dominion notes and today’s fiat monies, that qualify as legal tender. Counterfeits are usually detected by expert tellers working for legitimate currency issuers, rather than by ordinary members of the public. Counterfeit detection rates therefore depend on how often an issuer’s currency returns to it for processing. Unlike commercial banknotes, which tend to circulate only for relatively short periods before being returned to their supposed source, legal tender currencies tend to circulate until they wear out, that is, for years rather than a few days. Consequently the risk of fakes, and good ones especially, being quickly detected is relatively low. And the more widely a legal tender currency circulates, the more safe it is to imitate, other things equal. To treat the fact that Canada’s private banknotes were counterfeited as a flaw, despite the even more aggressive and troublesome counterfeiting of their closest substitutes, Dominion notes, is a perfect example of the Nirvana fallacy at work. Was Less than Perfect Note-holder Safety Inefficient? The same may be said of Fung et al.’s claim that Canadian banknote currency was flawed because persons who held it sometimes suffered losses when banks whose notes they held failed. Although we tend today to take for granted that currency should be free of default risk, we do so in part because we’re used to irredeemable fiat monies, which of course aren’t IOUs at all; alternatively, they are, in the immortal words of former Federal Reserve Bank President John Exter, “IOU nothings.” Still more precisely, fiat currencies, or most of them at any rate (including Federal Reserve Notes and modern Bank of Canada Notes), are free of default risk because their issuers have already defaulted. It’s hard to break an already broken promise! Things were, of course, different in the days of the gold standard. To their credit Fung et al. recognize this when, in discussing the characteristics of Dominion notes, they observe (p. 23) that “no fiduciary currency is 100 per cent safe.” The question, then, is whether Canada’s commercial banknotes were excessively risky compared to other fiduciary alternatives. Since no holder of Dominion notes suffered any loss until Canada went off the gold standard during the Great Depression, it’s easy enough to conclude commercial banknotes were riskier. But it doesn’t follow that they were excessively so, because the extra safety of Dominion notes came at a price, consisting of their exceptionally high specie backing. Would the extra cost have been a price worth paying to spare Canadian banknote holders their relatively modest losses? I doubt it: according to George Hague, although the Canadian system exposed note holders to some risk of loss, it also “rendered the small amount of active capital possessed in a partially developed country available to the utmost extent possible.” As anyone knows who has read Book II, Chapter II of The Wealth of Nations, or my own Cliff Notes version, available here and here, or Rondo Cameron’s Banking in the Early Stages of Industrialization, maintaining such heavy specie reserves meant devoting fewer funds toward productive investment. Still more do I doubt that it would have made sense to sacrifice the famous “elasticity” of Canada’s commercial banknote currency — a feature that helped Canada to avoid U.S.-style currency panics — for the sake of giving banknote holders a little more security. Yet such a sacrifice is exactly what would have been required had Canada stuck to it’s original plan to have Dominion notes, with their 100-percet marginal specie reserve requirement, supplant banknotes. I very much doubt it, though I cannot be certain. What I do know is that Fung et al. never bother to demonstrate that available alternatives to Canada’s imperfect banknotes would actually have been better, let alone perfect. Were Discounts on Solvent Banks’ Notes Inefficient? And how about those “slight” discounts to which notes of solvent banks were sometimes subject. Were they proof positive of market failure? Hardly. Just as banks that deal in foreign currency notes today must cover the costs involved in shipping those notes to and from their sources, early banks and banknote brokers had to be compensated for the cost of returning domestic banknotes to their (sometimes far-away) sources for redemption. In Canada, those costs were anything but trivial. Though Canada’s combined provinces are geographically larger than the U.S., at the time of its first, 1871 census it had only 2,779 miles of railroad to the United States’ 45,000 miles. Nor was the first trans-Canada railroad completed until 1885, some 16 years after the driving of the golden spike at Promontory Summit. Canada also had only about one-tenth as many people, most of whom lived far away from its cities. And “cities” is being generous. Only nine held more than 10,000 people, and only one (Montreal) had a population exceeding 100,000. Small wonder that banknotes found far from their sources were likely to be discounted! Moreover the tendency, independent of any legislative interference, was for those discounts to decline over time, and often to vanish altogether, as banks expanded their branch networks (and also, in time, as they found it worthwhile to form clearinghouses). For according to Roeliff Morton Breckenridge, upon whom Fung et al. rely for much of their information concerning Canadian banknotes’ lack of uniformity, it was only “the notes of a bank without a branch in the neighborhood [that] did not circulate at their par value in localities remote from where they were payable” (my emphasis). If Canadian banks’ branch networks didn’t grow, and note discounts therefore didn’t disappear, more rapidly than they did, the parsimonious explanation is, not that there was a market failure, but that a faster rate of expansion wouldn’t have been economically worthwhile. Better to let people bear a discount on “foreign” banknotes now and then than waste resources by placing bank branches (let alone clearinghouses) where the risks are too great, much less where wolves still outnumbered people. The gains from other schemes for keeping banknotes current might likewise fall short of the schemes’ cost. Consider what transpired in the U.S. There, a “uniform” currency was first established in 1864. But by what means, and at what price? The deed was done, first, by stamping-out the notes of state-authorized banks (a step that itself almost certainly did more harm than good), and, second, by including a clause (section 32) in the 1864 National Bank Act stipulating that every national bank must “take and receive at par, for any debt or liability to it” the notes of all other national banks. That of course meant that the banks could no longer afford to sort, mail, and return notes of rival banks to their sources for payment, as they would normally have been inclined to do. But, hey! The Draconian measure did after all give us a “uniform” currency, so what difference did it make whether the banks liked it or not? This great feature in our system as compared with the National Banking System, is generally overlooked, but it is because of this daily actual redemption that we have never had any serious inflation of our currency, if indeed there has ever been any inflation at all (p. 14). You see, a currency that was scarcely ever sent back to its sources for redemption bore the characteristics, not of ordinary, low-powered banknotes, but of a high-powered fiat money. The national banks might therefore have been tempted to issue them without restraint, had they not been simultaneously burdened by bond-backing requirements and, until 1875, a limit on their aggregate note issues. U.S. authorities, who wished to remove that aggregate limit, were fully aware of the problem, and sought to correct it by establishing, in 1874, a national banknote redemption Bureau in Washington. Unfortunately that solution never worked very well: for the most part, banks only sent the Bureau tattered, worn, and soiled notes that they couldn’t get rid of otherwise. It was, as Larry White and I have explained elsewhere, partly owing to the Bureau’s inadequacy, which informed legislators’ reluctance to relax bond-collateral constraints limiting national banks’ capacity to issue more notes, that the U.S. found itself saddled, for the rest of the century and beyond, with an utterly inelastic currency system, and consequent, recurring crises. Might U.S. citizens have been better-off, after all, putting up with the occasional banknote discount? To anyone conversant with the sad history of late 19th-century U.S. panics, the question answers itself. Once again, imperfect doesn’t always mean inefficient. Fung et al. (p. 30) mistakenly claim that it was only after the establishment of the Washington note redemption bureau in 1874 that “notes of the various national banks exchanged at par.” For the real purpose — and inadequacy — of that bureau, keep reading. When I say “occasional,” I mean it: as shown in my paper on state banknotes also linked to above, by the autumn of 1863, or not long before the reforms that were to establish a uniform U.S. currency, the aggregate discount on state banknotes (excluding notes of banks in the Confederacy, which were then no longer trading in Northern markets) was trifling. Had one purchased all the notes in question at face value, and then sold them to brokers in either Chicago or New York for what the brokers were paying in those markets, the loss would have amounted to less than one percent, even reckoning any note that brokers listed as unknown or uncertain as worthless.